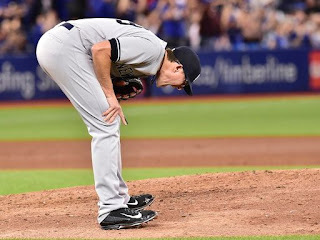 During yesterday's game, the bottom of the eighth inning was by far the most important inning for the Yankees to get through. Severino was out of the game after throwing seven solid innings, and due up for the Jays were Donaldson, Bautista, and Morales, who are arguably the three best hitters on the team. Most people would look at that situation and automatically say that the logical solution would be to bring Dellin Betances in to face the three of them. Even if Dellin is the closer, retiring those three was the most important moment of the game for the Yanks. Bring in one of the best relievers in baseball to face one of the best hitters, plus two pretty good ones, right? Joe Girardi thought otherwise. Since Dellin Betances is the ninth inning guy, he brought in the eighth inning pitcher, Tyler Clippard, who happens to be an extreme fly ball pitcher (0.62 ground out to fly out ratio in 2017, 0.47 in his career). Josh Donaldson, the first batter up in the inning, happens to be an extreme fly ball hitter. The rest is history. Honestly, I don’t have that much of a problem with the whole idea of having Clippard pitching the eighth inning and Betances pitching the ninth, until Aroldis Chapman comes off the DL. However, that formula should be nothing more than a guideline. That is not how every single game should be played. Dellin Betances is a top ten reliever in baseball and he has the ability to strike out hitters left and right. He’s the guy you bring in to get out of a big situation, like the at-bat against Donaldson. Forget the bullpen roles at that point. If there is a time where you need to keep the game scoreless, you bring in your best reliever. 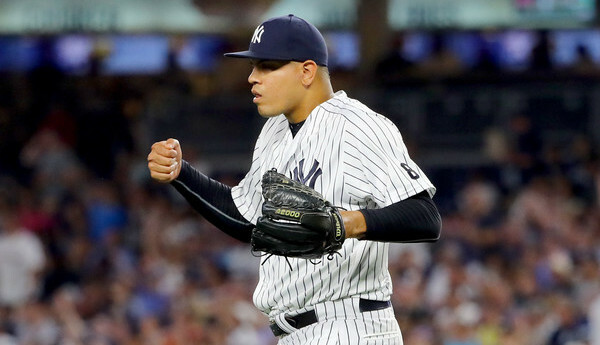 Of course, Girardi can’t utilize Betances the way Terry Francona used Andrew Miller in the playoffs last year, but the idea of bringing Betances earlier in the game, if the situation calls for it, is ideal. Bring him in when the game is on the line. Another problem I have with the bullpen usage: why not use Dellin for two innings? He has shown that he’s more than capable of completing more than one inning, so why not just send him out for both the eighth and ninth? Monday is an off day, and he would be rested. So, it’s not like he will be needed tomorrow. Plus, he pitched one time in the last week, which was on Saturday, in a 7-0 game, because he "needed to pitch". Girardi only brings him in for save situations, which is an awful use of such a great reliever. He has Clippard warming up every single game, though. Why not give some of Clippard’s innings to Betances? With that thought, that brings me to Clippard. He’s been a high leverage inning guy for most of his career. Yes, he was very good for the Yanks last year, but I can’t be the only one scratching my head as to how he has just a 1.88 ERA after today’s game, right? Every time he enters a game, it seems that a run scores. He’s actually blown just five games this year (it feels like way more.) Of those, three of them came with runners on base, which means he allowed the inherited runners to score. April 7th (the fourth game of the season) and today were the ones he came in with no one and a surrendered a go ahead run. That’s…not great. Definitely not the guy that I would want coming in for the highest leverage situations. This all brings me back to bullpen roles. Clippard blew three of these games in the eighth inning. Why not bring Dellin in instead, and have Clippard pitch the ninth? You have to use your best reliever in the most crucial situation. Most of the time, yes, that best situation is the ninth inning, which is why I’m okay with having Dellin Betances as the closer. But if that situation comes in the innings before it, that’s when he should be pitching. Don’t bring in Jonathon Holder with the bases loaded and one out in the seventh and then wonder why the game was lost.